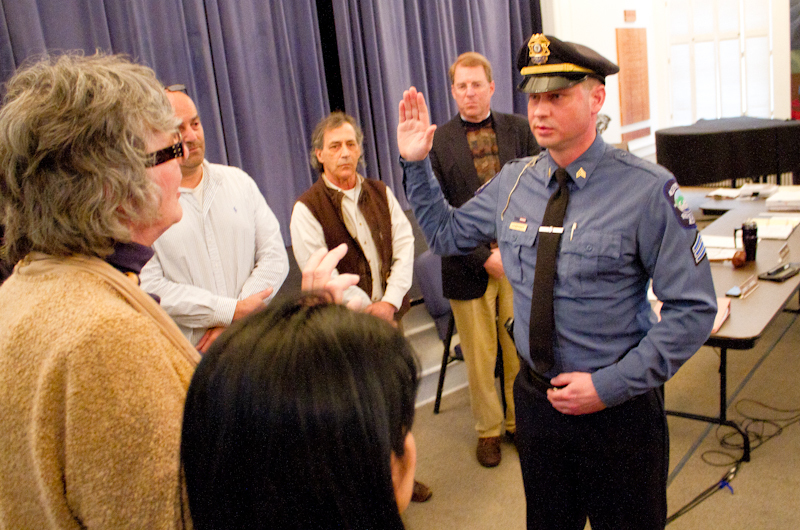 Tisbury police officer Chris Habekost was promoted to the rank of sergeant at Tuesday meeting. The town of Tisbury will be able to start one of its planned dredging projects ahead of schedule. Dredging on the small harbor entrance will begin June 1. The projects, approved at town meeting earlier this month, were not scheduled to begin until after fiscal year 2014 began on July 1. Voters approved a $500,000 borrowing item at the April 9 annual town meeting to approve the dredging of the harbor and Lake Tashmoo. Town treasurer Tim McLean said the town will borrow $260,000 at this time to dredge the harbor, the more pressing of the two projects. The money will be paid back using embarkation fees. The town will hold off on the planned dredging of Lake Tashmoo; embarkation fees cannot be used to repay borrowed funds for that project. Harbor master Jay Wilbur said the back entrance of the harbor is at risk of closing up with the next major storm. Sand from the dredging will be used to replenish Tisbury beaches at Owen Little Way and Grove avenue. In other news, Mr. Grande reported that phase one of the town’s first photovoltaic project is on track to begin construction on June 1, and that the board of health had approved usage of a town-owned compost pile for phase two of the project. Mr. Grande also noted that repairs on the Owen Park docks had been contracted out to Cricket and Raiman Builders, with work to begin in the next week. Department of Public Works director Fred LaPiana said the job would be completed by May 23. Repair work is also on track at the EMS building, with the elevator and plumbing now fixed, Emergency Services Facility chair Joe Tierney said. The heat and air conditioning systems are next on the punch list of items to be fixed before negotiations with the builders for reimbursement begin again, he said. Selectmen approved a transfer of $8,000 from the reserve fund for repairing two emergency service vehicles. The 2006 Ford Expedition used as a primary emergency response vehicle and the department’s primary ambulance will be repaired off-Island. The board also approved a transfer for tee shellfish constable to purchase new buoys. Patricia Carlet of the Tashmoo Spring Building Committee presented selectmen with a revised fee schedule for usage of the building, which was unanimously approved. Ms. Carlet said she had been approached by the Possible Dreams auction committee about donating the space as part of a wedding package at this year’s event. After some discussion, the board opted to reconsider the matter at their May 7 meeting. At the start of Tuesday’s meeting, Tisbury police officer Chris Habekost was promoted to the rank of sergeant. Sergeant Habekost has been an acting sergeant for the past year and is “doing a great job,” said police chief Dan Hanavan. The residents of Vineyard Haven and Fin Com should be questioning why the cost of dredging is doubled by using additional costly equipment to pump a relatively small amount of sand to West Chop, when cheaper alternatives are available, but ignored. Erosion is a problem everywhere, on Island and up and down the entire East Coast. It is not the responsibility of the Town to protect private property values by doubling the cost of a dredging project. The private residents should be paying for their share of the project. The material will wash right back down to the Back Channel and require maintenace every 5 yrs. The claim that the property owners have paid $50,000 needs close examination. The breakdown will be revealing. The cost of a report commissioned by private homeowners to assess their property conditions should not be the responsibility of the Town. Public access easements are required as this project uses public money on private beaches, and should be demanded by the Selectmen. These issues have been deflected by those who benefit from this project, while Selectmen push to sustatially raise mooring fees to pay for dredging. What is the eelgrass monitoring program involve and who is paying for this? And where is this eelgrass, which has delayed the project for years, located? Finally, 2 yrs ago the Selectmen voted to require that, due to the extra cost of a booster pump, property owners would be required to cover the extra cost beyond the cost of less expensive alternatives. This is not a new issue.